The study, titled "Homo floresiensis contextualized: a geometric morphometric comparative analysis of fossil and pathological human samples," is published in the July 10 edition of PLOS ONE. The ancestry of the Homo floresiensis remains is much disputed. The critical questions are: Did it represent an extinct hominin species? Could it be a Homo erectus population, whose small stature was caused by island dwarfism? Or, did the LB1 skull belong to a modern human with a disorder that resulted in an abnormally small brain and skull? Proposed possible explanations include microcephaly, Laron Syndrome or endemic hypothyroidism ("cretinism"). Important shape differences captured by statistical analysis of the cranium after removing size differences. 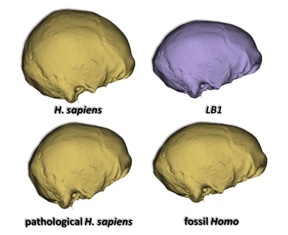 Healthy modern humans (Top left); modern humans with microcephaly (Bottom left); LB1 (Homo floresiensis) (Top right, shown in purple); and fossil humans belonging to the genus Homo (Bottom right). These images highlight how much taller and rounder the modern human braincase is compared to the other three groups when viewed from the side. More importantly, these images also illustrate how much more similar the LB1 skull is to fossil humans compared to modern humans suffering from microcephaly - a condition that results in a small brain size and therefore skull size - particularly in its low and elongated silhouette. The other two pathological conditions examined in this study, "cretinism" and Laron Syndrome, more closely resemble the healthy modern human condition than any of the other conditions. The scientists applied the powerful methods of 3-D geometric morphometrics to compare the shape of the LB1 cranium (the skull minus the lower jaw) to many fossil humans, as well as a large sample of modern human crania suffering from microcephaly and other pathological conditions. Geometric morphometrics methods use 3D coordinates of cranial surface anatomical landmarks, computer imaging, and statistics to achieve a detailed analysis of shape. This was the most comprehensive study to date to simultaneously evaluate the two competing hypotheses about the status of Homo floresiensis. 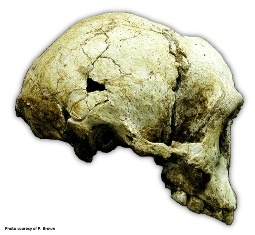 The study found that the LB1 cranium shows greater affinities to the fossil human sample than it does to pathological modern humans. Although some superficial similarities were found between fossil, LB1, and pathological modern human crania, additional features linked LB1exclusively with fossil Homo. The team could therefore refute the hypothesis of pathology. "Our findings provide the most comprehensive evidence to date linking the Homo floresiensis skull with extinct fossil human species rather than with pathological modern humans. Our study therefore refutes the hypothesis that this specimen represents a modern human with a pathological condition, such as microcephaly," stated the scientists.